For the Richard Beirach album, see Hubris (album). Hubris (/ˈhjuːbrɪs/, from ancient Greek ὕβρις) describes a personality quality of extreme or foolish pride or dangerous over confidence, often in combination with (or synonymous with) arrogance. In its ancient Greek context, it typically describes behavior that defies the norms of behavior or challenges the gods, and which in turn brings about the downfall, or nemesis, of the perpetrator of hubris. The adjectival form of the noun hubris is "hubristic". Hubris is usually perceived as a characteristic of an individual rather than a group, although the group the offender belongs to may suffer collateral consequences from the wrongful act. Hubris often indicates a loss of contact with reality and an overestimation of one's own competence, accomplishments or capabilities. The Greek word for sin, hamartia (ἁμαρτία), originally meant "error" in the ancient dialect, and so poets like Hesiod and Aeschylus used the word "hubris" to describe transgressions against the gods. A common way that hubris was committed was when a mortal claimed to be better than a god in a particular skill or attribute. Claims like these were rarely left unpunished, and so Arachne, a talented young weaver, was transformed into a spider when she said that her skills exceeded those of the goddess Athena. Additional examples include Icarus, Phaethon, Salmoneus, Niobe, Cassiopeia, and Tereus. These events were not limited to myth, and certain figures in history were considered to be have been punished for committing hubris through their arrogance. One such person was king Xerxes as portrayed in Aeschylus's play The Persians, and who allegedly threw chains to bind the Hellespont sea as punishment for daring to destroy his fleet. What is common to all these examples is the breaching of limits, as the Greeks believed that the Fates (Μοῖραι) had assigned each being with a particular area of freedom, an area that even the gods could not breach. The goddess Hybris has been described as having "insolent encroachment upon the rights of others". The word hubris as used in the New Testament parallels the Hebrew word pasha, meaning transgression. It represents a sense of false pride that makes a man defy God, sometimes to the degree that he considers himself an equal. In contrast to this, the common word for sin was hamartia, which refers to an error and reflects the complexity of the human condition. Its result is guilt rather than direct punishment as in the case of hubris. 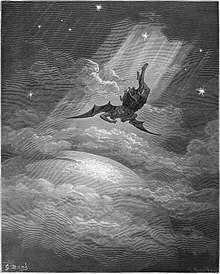 Examples of hubris are often found in literature, most famously in John Milton's Paradise Lost, in which Lucifer attempts to compel the other angels to worship him, is cast into hell by God and the innocent angels, and proclaims: "Better to reign in hell than serve in heaven." Victor in Mary Shelley's Frankenstein manifests hubris in his attempt to become a great scientist; he creates life through technological means, but comes to regret his project. Marlowe's play Doctor Faustus portrays the eponymous character as a scholar whose arrogance and pride compel him to sign a deal with the Devil, and retain his haughtiness until his death and damnation, despite the fact that he could easily have repented had he chosen to do so. An example in pop culture is the comic book hero Doctor Strange, wherein highly talented and arrogant neurosurgeon Dr. Stephen Strange is involved in a vehicular accident. Unlike the Greek figures Salmoneus, Icarus and Phaethon, he survives, though his hands are severely damaged, and thus his career as a neurosurgeon is shattered. After western medicine fails to help him, he seeks healing in the mystic arts, and though he never fully recovers, he becomes a powerful sorcerer. A historical example of hubris was furnished by General George Armstrong Custer in the decisions that culminated in the Battle of Little Big Horn; Custer is apocryphally quoted as having exclaimed: "Where did all those damned Indians come from?" C. S. Lewis wrote in Mere Christianity that pride is the "anti-God" state, the position in which the ego and the self are directly opposed to God: "Unchastity, anger, greed, drunkenness, and all that, are mere fleabites in comparison: it was through Pride that the devil became the devil: Pride leads to every other vice: it is the complete anti-God state of mind." ^ "Definition of HUBRIS". www.merriam-webster.com. Retrieved 2016-04-22. ^ Cartledge; Paul Millett (2003). Nomos: Essays in Athenian Law, Politics and Society. Cambridge University Press. p. 123. ISBN 978-0-521-52209-0. Retrieved 2011-11-14. ^ "Hubris". Encyclopædia Britannica. Retrieved 21 April 2016. ^ Rehm, Rush (2014). Radical Theatre: Greek Tragedy in the Modern World. Google Books: A&C Black. p. 75. ISBN 9781472502339. Retrieved 2 October 2018. ^ Cornelius Castoriadis. Ce qui fait la Grèce, tome 1: D'Homère à Héraclite, chapitre V. Editeur: Seuil (9 mars 2004). Chisholm, Hugh, ed. (1911). "Themis" . Encyclopædia Britannica. 26 (11th ed.). Cambridge University Press. p. 758. ^ "The 1920 Farrow's Bank Failure: A Case of Managerial Hubris". Durham University. Retrieved October 1, 2014. ^ Lewis, C.S. (2001). Mere Christianity : a revised and amplified edition, with a new introduction, of the three books, Broadcast talks, Christian behaviour, and Beyond personality. San Francisco: Harper. ISBN 978-0-06-065292-0. Cairns, Douglas L. (1996). "Hybris, Dishonour, and Thinking Big". Journal of Hellenic Studies. 116: 1–32. doi:10.2307/631953. MacDowell, Douglas (1976). "Hybris in Athens". Greece and Rome. 23 (1): 14–31. doi:10.1017/S0017383500018210. Look up hubris in Wiktionary, the free dictionary.